系 行 舟 谁 遣 卿 卿？Who sends you, my fair songstress, to my boat? 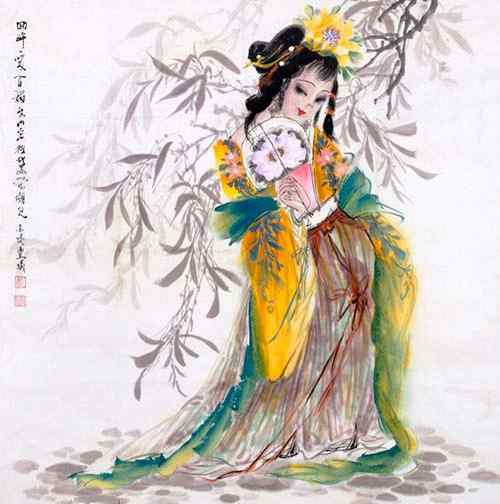 爱 林 下 风 姿，I love you come like breeze into the wood with ease. 云 外 歌 声，Beyond The cloud your songs float. 总 是 才 情。In which I find a genius mind. 恰 绿 树 南 薰 晚 晴，The south wind blows from green woods into evening sky. 险 些 儿 羞 杀 啼 莺。Your songs would make warbling orioles feel shy. 客 散 邮 亭，When guests leave the post, I seem to be lost. 醉 梦 初 醒。I write this on the stream.